My doctoral research focuses on an early-diverging clade of caesalpinioid legumes known as the Dialiinae. This pan-tropical group of around one hundred tree and shrub species displays a high level of floral morphological diversity, particularly in the form of organ loss and organ-number instability. Furthermore, systematic relationships within the clade are poorly understood. 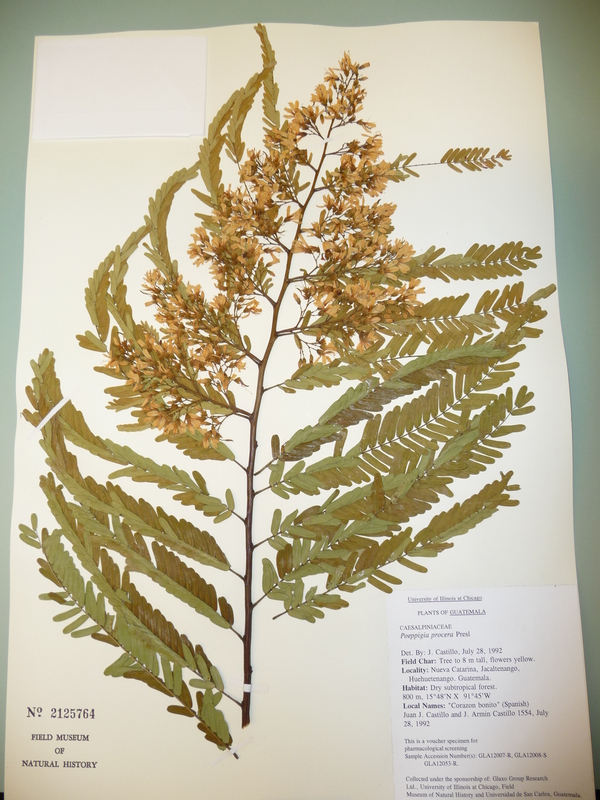 A herbarium specimen of the Dialiinae species Poeppigia procera, used in the morphological study. I am conducting an extensive morphological study of these species which will be combined with molecular data I have obtained via chloroplast and low-copy nuclear gene sequencing. Together, these data sets will be used in a phylogenetic analysis to determine how the taxa of the Dialiinae evolved and how they relate to one another. A second aspect of my research involves the use of scanning electron microscopy to study the early development, or ontogeny, of the flowers in this clade. As floral organs develop around the meristematic apex, their timing and order of initiation, as well as subsequent suppressions and fusions, can give clues to taxonomic alliances which are not apparent in the static form of the mature flower. It is my hope that floral ontogenetic work will provide insights into the unusual floral evolution of this clade. 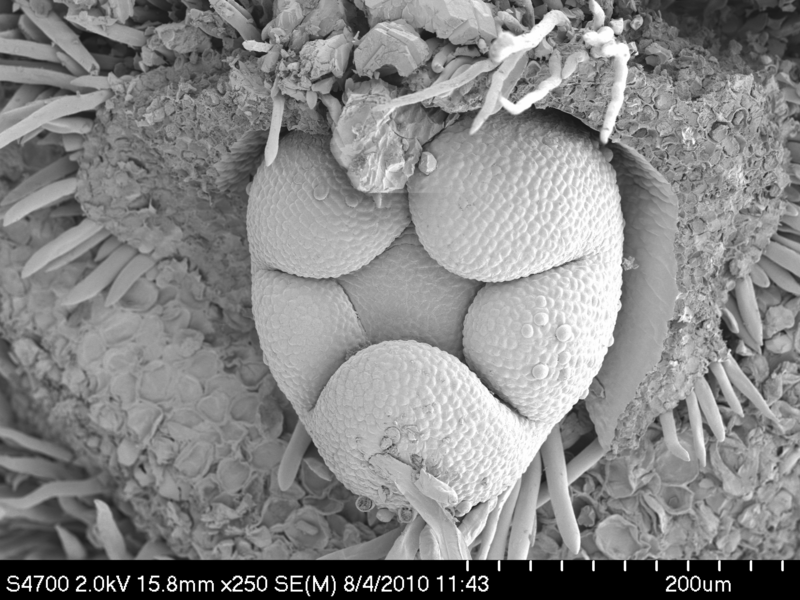 SEM image showing sepal development in Martiodendron excelsum. Zimmerman, E., Prenner, G. and A. Bruneau (2013) “Floral ontogeny in Dialiinae s.l. (Caesalpinioideae: Cassieae), a study in organ loss and instability.” South African Journal of Botany. In press, available online. Zimmerman, E., Prenner, G. and Bruneau, A. (2013) “Floral morphology of Apuleia leiocarpa (Dialiinae: Leguminosae), an unusual andromonoecious legume.” International Journal of Plant Sciences. 174(2): 154-160. Chevalier, E., Loubert-Hudon, A., Zimmerman, E. and D.P. Matton. (2011) “Cell-cell communication and signalling pathways within the ovule: from its inception to fertilization.” New Phytologist. 192: 13-28. Boon, E., Zimmerman, E., Lang, B.F. and M. Hijri. (2010) “Intra-isolate genome variation in arbuscular mycorrhizal fungi persists in the transcriptome.” Journal of Evolutionary Biology. 23: 1519-1527. Zimmerman, E., St-Arnaud, M. and M. Hijri (2009) “Sustainable agriculture and the multigenomic model: how advances in the genetics of arbuscular mycorrhizal fungi will change soil management practices.” In: Plant Microorganism Interactions. Eds. Kamal Bouarab and Normand Brisson. CABI, Oxford, UK., pp. 269-287. Zimmerman, E. and R.L. Peterson (2007). “Effect of a dark septate fungal endophyte on seed germination and protocorm development in a terrestrial orchid.” Symbiosis. 43(1): 45-52. 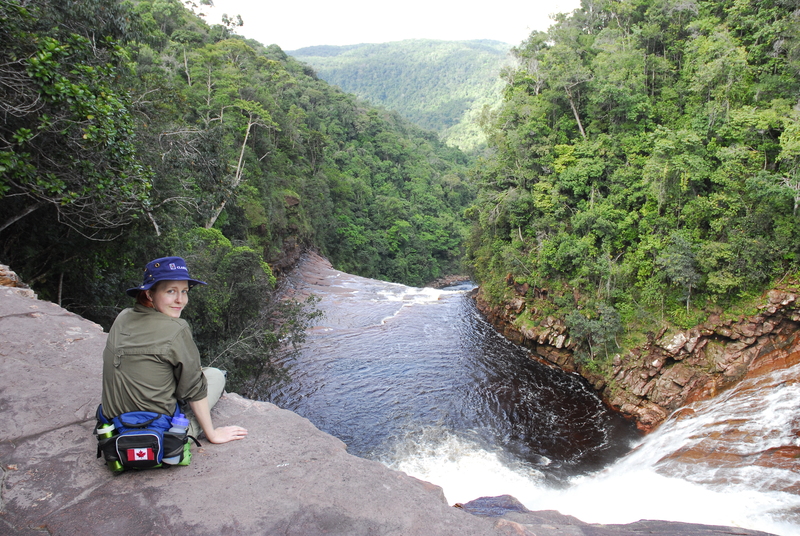 Collecting plant specimens in the rainforests of Guyana.